Are you new to anamorphic cinema? Are your theater and screen a good match? 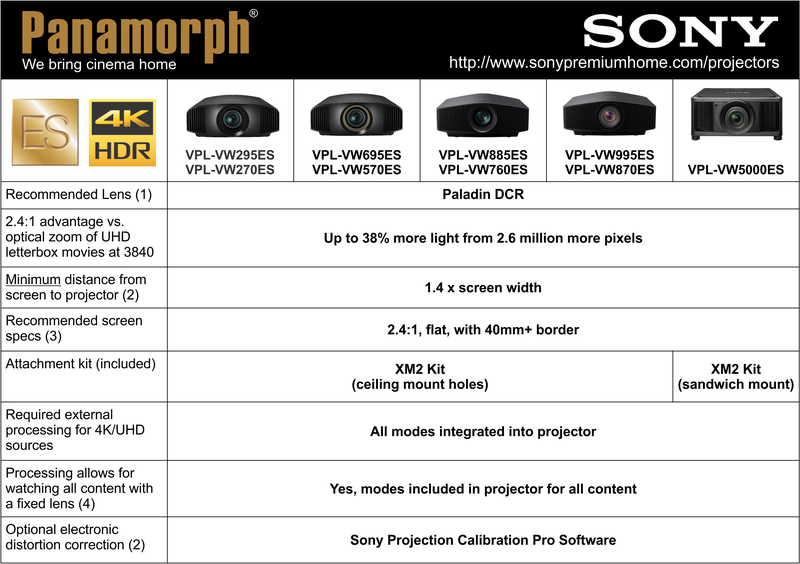 Paladin and Paladin DCR lens systems are fully compatible with the new anamorphic modes incorporated into all 2019 Sony native 4K/4096 projector models for showing big screen movies and TV content on a 2.4:1 screen with instantaneous push button control and no moving parts, delivering up to 2.6 million more pixels for greatly enhanced detail and overall brightness when showing over 80% of the most popular movies made in the cinema standard 2.4:1 aspect ratio. This includes the full line of Sony 4K ES projector models VPL-VW5000ES, VPL-VW995ES, VPL-VW885ES, VPL-VW695ES and VPL-VW295ES. Due to the ideal match with the native 4K/4096 wide resolution of these projectors we highly recommend the Paladin DCR for full 4K/4096 anamorphic cinema using Sony’s integrated “1.24x” anamorphic lens setting with the “V-Stretch” aspect mode for all 2.4:1 movies and a number of modes for showing 16:9 TV or smaller content (see the “How it Works” link at right). The standard Paladin lens can also be used with all these models using the Sony “1.32x” setting but will be limited to using 3840 wide resolution instead of the full 4096 resolution of the projector. All Sony projectors can be easily installed with Panamorph lenses using the included XM2 attachment kit which sandwiches between the projector and ceiling mount. 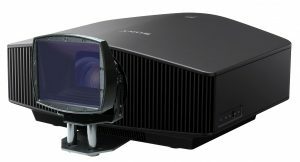 For more information about the full line of Paladin DCR compatible Sony 4K projectors please go to www.sonypremiumhome.com. (1) All the above Sony projector models are also fully compatible with the standard Paladin lens. However, the standard Paladin will a) provide less brightness and detail enhancement by using only 3840 out of the full 4096 horizontal resolution, b) create slightly greater edge distortion at any given throw ratio, and c) is only recommend down to a minimum 1.6:1 throw ratio. For these reasons alone the Paladin DCR is by far the most recommended and most used lens model. (2) At the lowest recommended throw ratio of 1.4:1 the Paladin DCR creates a slight, barrel shaped edge distortion requiring overscan onto the screen border of about 0.005 X screen diagonal. This edge distortion decreases with higher throw ratios (ie longer throw distances for a given screen size) and is very difficult to see above 1.8:1. The Sony projector models above can partially correct for residual distortion when installed by authorized Sony dealers using the Sony Projection Calibration Pro software (also available from Panamorph). (3) 2.4:1 is the preferred, industry standard aspect ratio for new screen installations to fit most movies since 1971. Paladin lenses can be adjusted to help fit 2.4:1 movies to an older 2.35:1 screen. Flat screens are always recommended to minimize additional barrel distortion at the top and bottom of the image due to the screen curvature. A screen border width of at least 40mm is highly recommended to mask residual distortion and slight content aspect ratio variations. Please see the Anamorphic Cinema Design Guide for complete details. (4) Use the Sony projector’s anamorphic lens setting of “1.24x” for the Paladin DCR lens (or “1.32x” for the Paladin lens). Set the projector’s aspect ratio to “V-Stretch” for UltraWide movies and “Squeeze” for 16:9/1.85:1 content in the proper format. Please see How Anamorphic Cinema Works for complete details on how to watch different content using the Paladin DCR.